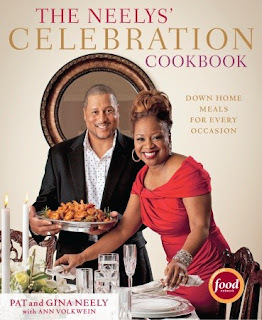 A Well-Seasoned Life: Cookbook Review: "The Neelys' Celebration Cookbook"
Cookbook Review: "The Neelys' Celebration Cookbook"
﻿When I first saw the cover of Pat and Gina Neely's new cookbook, The Neelys' Celebration Cookbook, I thought the recipes would center around the Thanksgiving and Christmas holidays. But, once I actually started reading the book, I saw that the Neelys celebrate all year round. No occasion is too small to gather family and friends for the fellowship of food. ﻿The cookbook begins with entertaining tips from both Gina and Pat. It's then laid out chronologically from January to December with celebrations and recipes for each month. Yes, there are reasons to celebrate every month of the year and the Neelys will share their personal stories and reasons for these celebrations. You may even be inspired to find a new reason to celebrate, too. Gina Neely seems like quite the hostess and I have no doubt that I would feel welcome in her home. But, being a little introverted myself, I could easily identify with Pat who, after preparing the food, likes to fade into the background and observe the action, loving the satisfaction of watching people enjoy the food he's prepared. As for the recipes, there are so many wonderful recipes in this cookbook. I'm always looking for a great, new appetizer and found it in Tanya's Spicy Spinach Dip - a far cry from your typical hot spinach dip with the addition of heavy cream and spicy Ro*tel tomatoes. 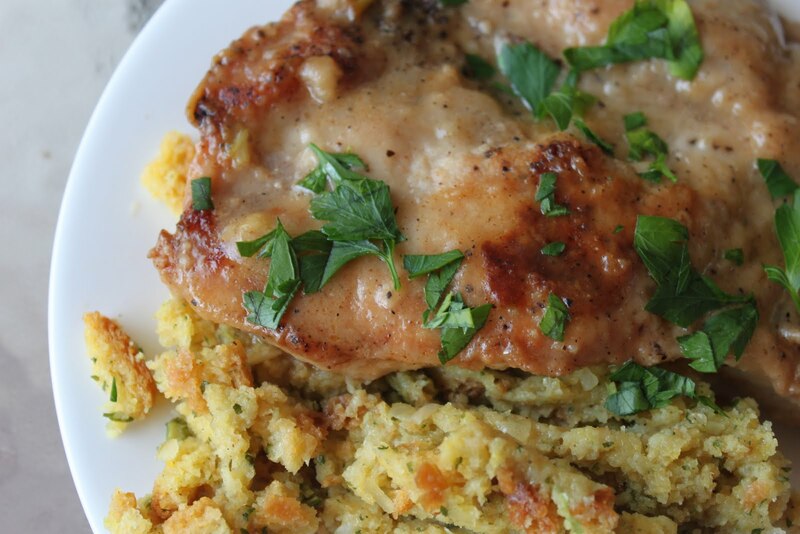 This dish will definitely make its appearance over the holidays. I also share Gina's sweet-tooth and must make her sister's Devil's Food Cake - rich, classic, and perfect for any celebration. I always like to have my husband look through my cookbooks to see if he finds a dish that he's drawn to. There were so many in this cookbook that would be considered man-pleasing. One of the recipes that he chose for my to-do list was the Dirty-Rice Collard Green Bundles. 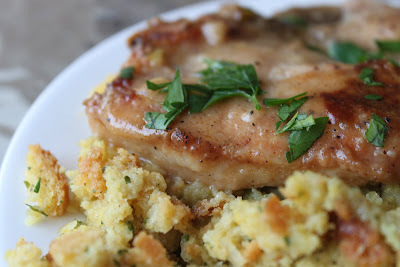 Another recipe that I just knew he would love is Smothered Pork Chops. Pat the chops dry with a paper towel, and season with salt and pepper. Combine the flour, onion powder, garlic powder, cayenne, smoked paprika, salt, and pepper on a rimmed plate. Dredge the chops through the mixture on both sides. Heat a cast-iron skillet over medium heat, and coat with the oil. When the oil is hot, slip in the chops and fry on each side, about 5 minutes per side, until golden brown. Remove the chops to a plate and set aside. Toss the green onions into the pan, and saute until fragrant, about a minute. Add 3 tablespoons of the seasoned flour (left over from dredging the pork chops) to the skillet, and stir with a wooden spoon until it makes a paste. Slowly whisk in the chicken broth, making sure there are no lumps. Turn up the heat, and allow the chicken broth to reduce and thicken, occasionally stirring. Once the sauce coats the back of your wooden spoon, pour into the buttermilk, and add a dash of hot sauce. Stir to combine. Return the pork chops to the skillet, and simmer for 15 more minutes, until the chops are cooked through. Sprinkle with chopped parsley before serving. This would be perfect served over rice or mashed potatoes. You'll definitely want a side dish will take advantage of the delicious gravy. I chose to serve it over stuffing. Excellent! 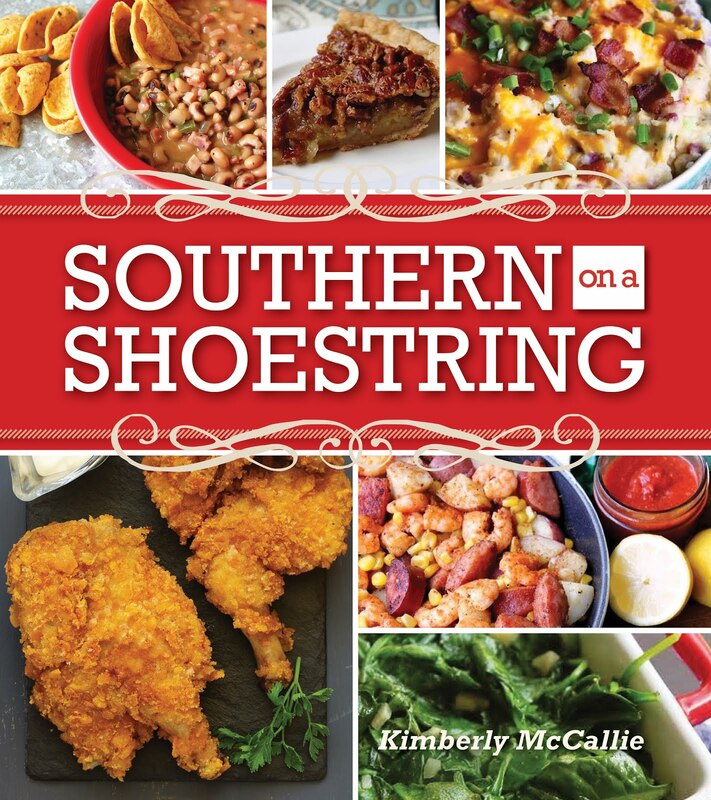 The cookbook is loaded with full-page color photographs of the Neely family and their food. If you're a fan of Food Network's Down Home with the Neelys, I know you'll love this cookbook. But, even if you're unfamiliar with the show, you'll enjoy getting to know this family and sharing their love for food and for each other. The publisher provided a copy of the cookbook; however, the views expressed here are my own. I'll have to keep my eye open for this one - sounds great! I have been debating getting this book. I have a free book in a book club, that I belong to and I have been debated what to get. Now, I think, I know what to do. Look delicious, I love watching Down Home with the Neelys! I am trying to find out where I get some autograph copies of your lastest cookbook. I went to Costco's and was informed they had been sent back to the publisher. I would contact the publisher regarding the autographed copies of the cookbook. They may be able to assist you in locating one. Here's the web site: http://cooking.knopfdoubleday.com/. I'm glad I found your blog :) I was looking for reviews on this recipe. I received this book as a Christmas gift. I love it so far. Tonight I'll be making the smothered porkchops. A few weeks ago I made the Cherry Cola BBQ sauce and rub and used it on some chicken. Delicious. I tried this recipe with a couple of small changes and LOVED it! The buttermilk makes it - so don't skip it. I used a regular sweet onion instead of the green onions and based on some other recipes I looked at, used half chicken broth and half beef broth. Oh, and because I love the gravy over rice, I doubled those ingredients. My husband and I ate this two nights in a row we loved it so much.